Take a break surrounded by the scenic landscapes of Abha. At over 2,000m above sea level, the capital of Asir boasts Saudi Arabia’s highest peaks and a cooler climate than other parts of the Kingdom. Take a break surrounded by the scenic landscapes of Abha. At over 2,000m above sea level, the capital of Asir boasts Saudi Arabia’s highest peaks and a cooler climate than other parts of the Kingdom. With its natural beauty and tranquil local atmosphere, it’s the perfect holiday destination for combining adventure and relaxation. 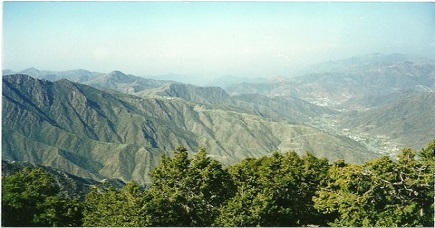 Abha known for the craggy mountains of Aseer National Park. At the heart of downtown Abha is the restored mud-walled Shada Castle, now a handicrafts museum. Nearby, the Al-Muftaha district has stone houses and a weekly market with crafts and curios. A visit to Abha Citys attraction like Al Muftaha village, Shada Palace, Visitors Center and Tuesday's traditional marketplace. You can during your sight seeing tour enjoy a cable car ride from New Abha to the Green Mountain passing through the parks of Abou Khayal where you will find Tihama Valleys and spectacular view of Abha City. Children can enjoy the entertainment and water sports provided at New Abha resort. Abha Exhibition Center is close to Abha Airport, centrally located between the two cities of Abha and Khamis Mushayt. The Abha International Exhibition Center provides a total of 8000 square meters in five exhibition halls around a semi-open central area, plus a state-of-the-art auditorium for 550 delegates with additional conference rooms and full support services. Just two kilometers from Abha airport, the center includes a leisure complex with a 60-room motel and health club. Attractions include a bowling center, restaurants and cafeterias and indoor sports arena. There are also outdoor facilities for tennis, football and horse riding, with a children's play area. You can visit Princes Sultans Park, Al Qara resort, Al Masqi Park and children's Entertainment Park. If you wish you can rest at Prince Sultans Park and spend the best times with your family. A special garden is available for campers. Priding along a hill beside the picturesque Lake Saadd, The New Abha Resort and Apha Palace Hotel are located in the most beautiful Part of Abha City with super views across the city and the rolling hills and blue mountain park, impressive cable car rides into the surrounding mountains, and a range of high quality accommodation. Accessible via paved highways winding through the mountains, or only 55 minutes from Jeddah by air, New Abha is ideally situated to explore the fascinating architecture of Abha City and spectacular Asir region. Green Mountain restaurants & cafés are located at Abha City on the highest point of Jebal Thera, with dramatic views over Abha City & the surrounding regions. In addition, there is an open coffee shop where you can enjoy fresh air and there is a full equipped Internet café. Al Soudah is situated on Sirwat Mountains in the Magical area of misty Sirwat, located at the highest point in Asir, west of Abha City, 3000 meters above sea level and 30 minutes from Abha airport. The mountains are covered with Araar trees and natural forest and contain one of Asirs largest national parks.